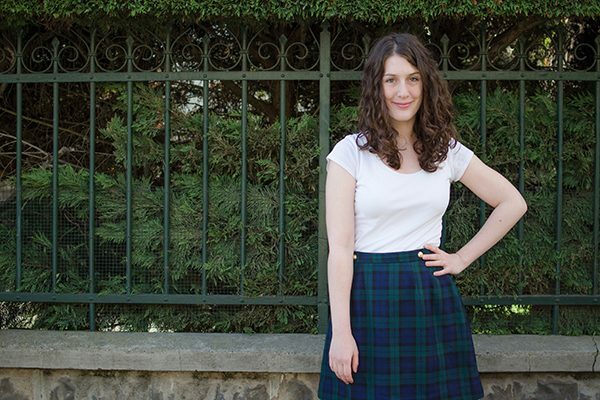 This cute little skirt is the very first wearable version of the Agave skirt! With the phenomenal success of the Sirocco jumpsuit the other two patterns have gone under the radar, but personally I think Agave is the most wearable of the three and it’d be a shame for it to go unnoticed! 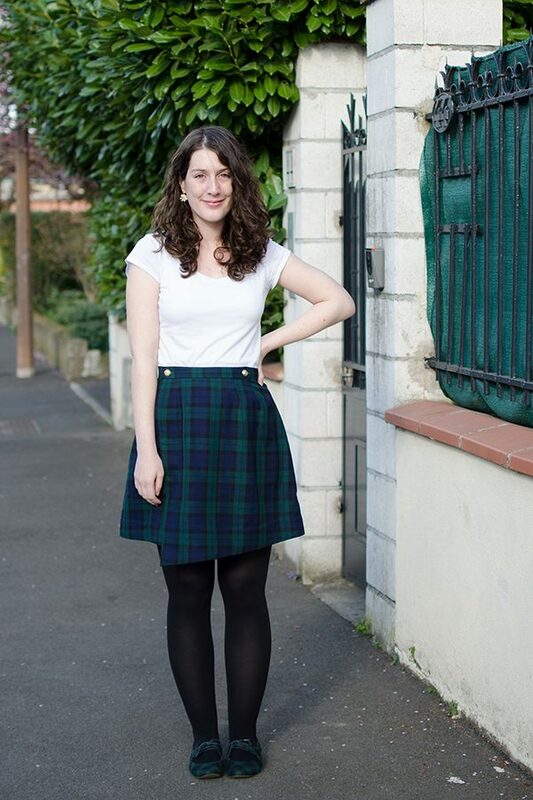 I’ve always worn a lot of skirts, but mostly knee-length gathered skirts, kind of 50’s style. 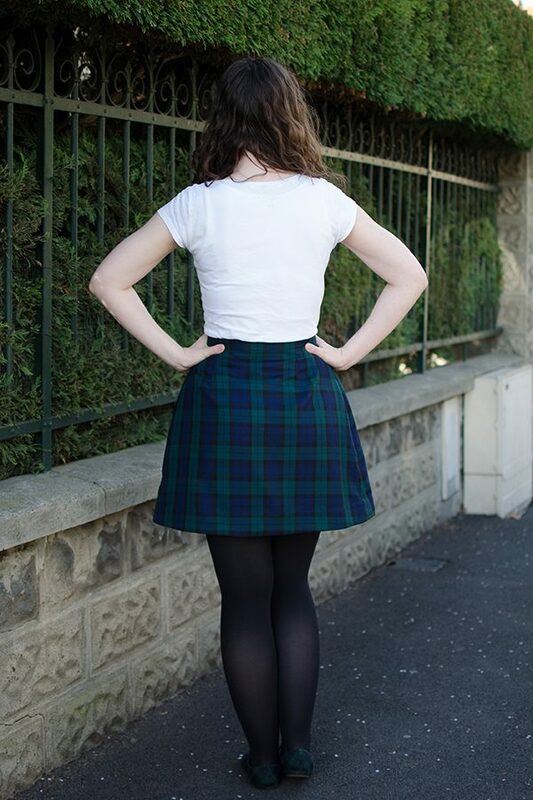 Over the last few years my style evolved little by little and became slightly less retro, and for instance I’m wearing my Rosari skirts a lot, which are A-line and much shorter. Of course they’re still is pretty retro, but maybe more 60’s than 50’s now… Decade by decade, maybe I’ll end up catching up with today’s trends eventually! Agave is very much in that style, with its high waist and A-line shape which work great with my pear body. 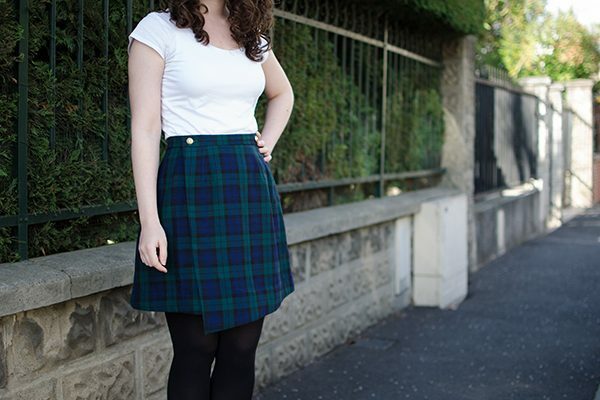 I also love the fact that it’s short, perfect to wear with tights in the spring or fall. The assymmetry and wrap construction add just enough interest to elevate this basic skirt, but not too much that it’s not wearable on a daily basis. To be honest, I never wear wrap skirts or dresses, mostly because I’m very clumsy and never safe from wardrobe accidents. That beind said, I feel very comfortable with Agave! The under layer gives a lot of coverage, and I’ve never felt like too much skin was ever exposed with this skirt, even when sitting down. I get a similar feeling with the Pensée skirt, which I’ll talk about soon and which is designed specifically to handle winds and all. 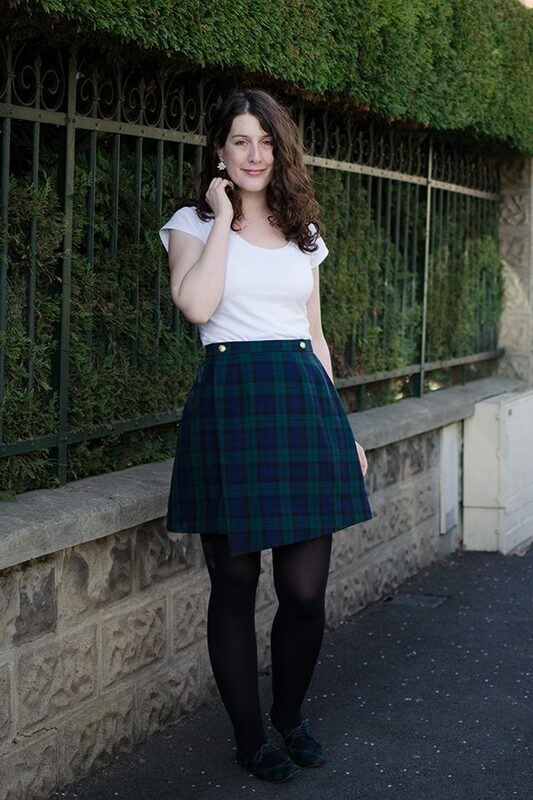 I always try to take advantage of sewing wearable muslins to use up fabrics from my stash, and with this skirt I was able to use a piece of fabric that had been hidden in a box for over 4 years. It was actually from a Sew Over It kit, and was supposed to become a pencil skirt. Unfortunately, after many years I had to face the facts, pencil skirts are not my jam and I really don’t see myself wearing one: too stuffy, too “office” for me since I work from home, too uncomfortable… I barely wear my jersey knit Brume skirts, so a woven pencil skirt was out of the question. So I repurposed the fabric from this kit, and luckily I had just enough for Agave! Since it was a kit I don’t have a lot of information on what the fabric was and where it was from, apart from it being a “wool mix” (mixed with polyester I suppose). The quality is decent, not amazing, but I love the colors of this tartan and I had fun matching the plaid (yes, even on a wearable muslin that I had to sew in a very limited time, I can’t help myself…). And the one thing that makes me smile is that by chance (or maybe because I have such limited taste) I own a perfectly matching pair of tartan shoes! 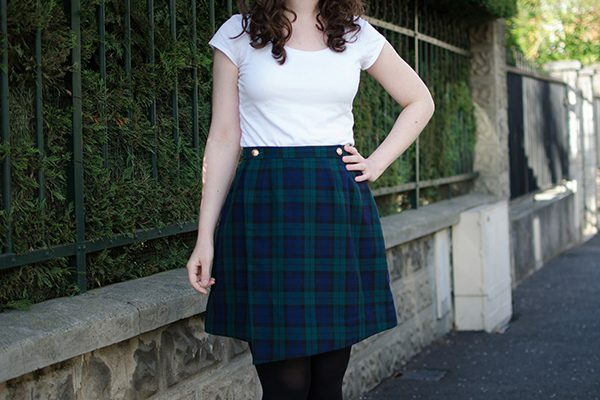 This version of the skirt is not reversible, it’s version B which is finished with a facing. Normally the buttons should be hidden inside the waistband and the skirt would look very sleek and minimalistic, but I wanted visible buttons so I made the buttonholes on the overlayer instead of the underlayer. I used golden buttons with tiny anchors that I found at the bottom of my button box. 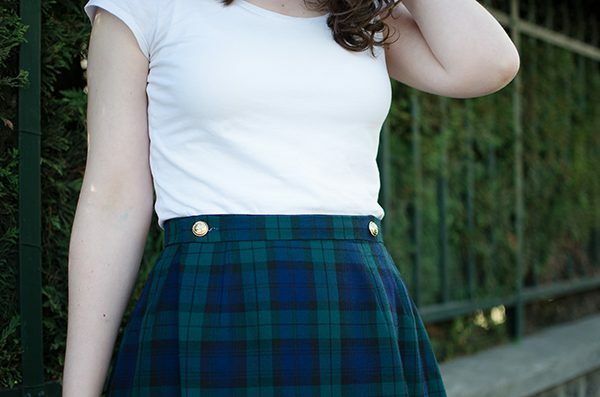 They’re super cheap plastic buttons, but I think the complete the plaid mini-skirt look perfectly. I’d like to sew a reversible version of Agave, just for the sake of it, but for now I’m not very inspired in terms of colors and fabrics. 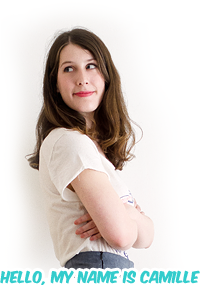 I think I might start by cleaning out my wardrobe and figure out what I’m missing (even though I strongly suspect I’m missing tops rather than skirts…). This would also be the opportunity to improve the fit in the back with a bigger FBA, since as is the fabric is pulling at my lower back. 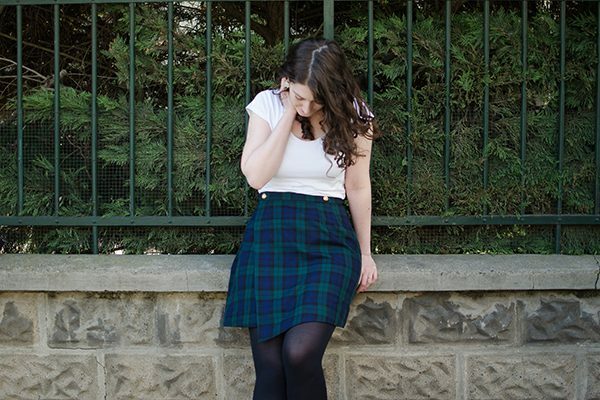 But apart from this I am very happy with this skirt, and I intend to wear it a lot before summer arrives!